The 109-key Apple Keyboard features full-size cursor keys perfect for zipping up, down and sideways in a game or on a spreadsheet. Special keys provide immediate access to the system audio level (volume up, down, mute) as well as ejecting media from the Mac optical drive. Additionally, 16 full-size function keys give applications plenty of ways to provide short cuts to common tasks. The Apple Keyboard also comes with additional full-sized keys for Page Up and Down, Home and End, Insert and forward Delete. Features 2x USB ports on the back side for connecting a USB mouse and other peripherals. 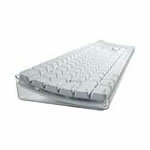 This used Apple Pro Keyboard is in good condition and ready to ship out.